LT Agriculture is a Premium and Free Responsive WordPress theme designed especially for fruits or farmer websites. This is eye-catching theme built with fancy colors. So it is useful for farmer to promote family farming operation, agribusiness development corporation agricultural organizations on the Internet. 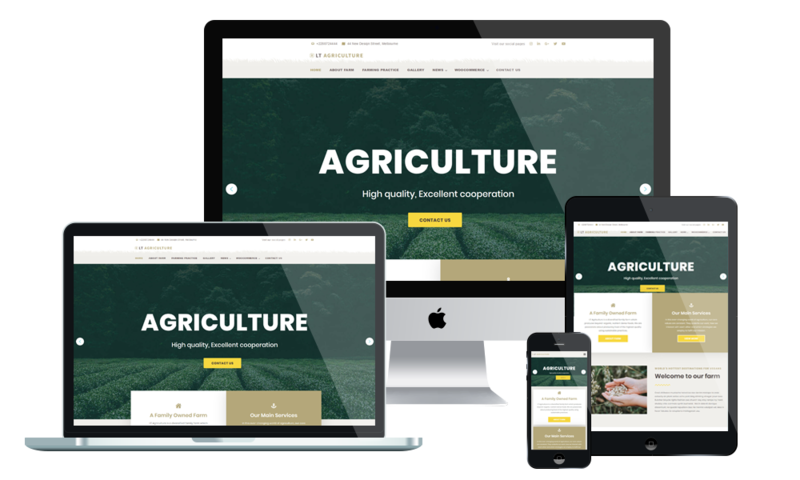 LT Agriculture is fully responsive template that adapts to the screen resolution of all mobile devices – smartphones, tablets and desktops. The template framework come with many features such as powerful shortcodes for present content easily, drag-drop layout content, Bootstrap CSS & Hybrid framework. Especially, with the help of its unlimited color and a color picker in the admin panel, you can create an elegant presence for your site with various layouts. You want to introduce something about the development as well as the goals of your company. So through this site, it is easy for you to present your desire. Besides, you also exhibit to all customers the development over the period to get a strong company like today. Customers could be easy to find out the address, phone number, or fax number of your company on this page. With the separated tabs, they could figure out any needed information about your company. By the map on this site, customers also determine your companys location and send the feedback to management department just a click.